Many neuroscientists around the world have concluded that only 5% of all cognitive activities are conscious decisions, leaving 95% to the sub-conscious mind. You may think that this is a startling amount, as you are in full control of your body and fingers, scrolling down to read the rest of this blog post. What you won’t realise is that as you read, your body is autonomously blinking, breathing, digesting and doing a host of other necessary bodily functions. In fact, our five senses are processing 11 million pieces of information every second, and of these 11 million, only 40 enter our conscious awareness.In a marketing capacity, the subconscious mind is responsible for evoking certain emotional responses dependent upon colour, shapes, environment and perhaps most importantly, pricing. The perception of price can make or break a sale and therefore it can be useful to alter this perception through subconscious influences Below are 3 psychological strategies that sellers are using to encourage buyers to purchase. One cent can make a huge difference in the decision-making process of a consumer. Charm pricing involves using prices that end in 9, 95 or 99 and has long been used as a technique that lowers the perceived magnitude of a price. Strategically lowering the price of an item by one cent is also extremely effective in lowering this perceived magnitude, but only when used correctly. Lowering the price from $8.50 to $8.49 is not going to have a significant psychological impact, as the perceived value of the product will not change. Lowering the price from $8.00 to $7.99 on the other hand, will have a greater impact as the perceived value will have decreased. This strategy is referred to as the ‘left-digit effect’ and is successful because we read numbers from left to right and therefore anchor the magnitude of the price on the left-most digit. Luckily for Macklemore, when he goes thrift shopping he’ll now know that when he buys his Leopard Mink for only 99 cents, he’s being played. Large prices such as yearly memberships or subscriptions can often seem daunting and overwhelming for consumers. Take for example a yearly gym membership of $400. As a lump sum, it appears quite unnecessary to be paying $400 for a year’s worth of access to exercise. If, however, the price was to be reframed into its daily equivalent, the perception of a lower price would be created. Broken down into a daily figure, this $400 becomes a more palatable $1.09 per day. 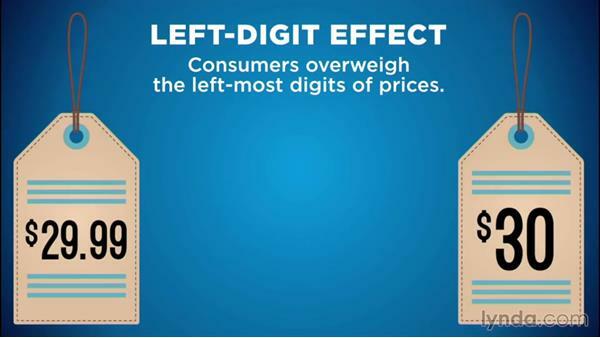 As with the Left-digit effect, by providing a daily equivalence figure, the perceived magnitude of the price is significantly reduced and encourages consumers to buy. Another way in which to provide the daily equivalence is to compare the price per day to an everyday expense, such as a daily train fare or a morning (or lunch, afternoon, dinner or all of the above) cup of coffee. This helps put large prices into perspective, and makes it easier for consumers to evaluate value. The payment part of the consumption process can often be painful and has even been coined as the ‘pain of paying’. This includes 2 main features: 1, consumers feel more pain when they see money leaving their possession, and 2, feel more pain if they pay after they consume. Keeping that second point in mind, it would therefore be more effective to charge customers before they purchase a product or service. In doing this, consumers will focus more on the benefits that they are yet to receive as opposed to the ‘pain’ felt in knowing that the benefits have already been experienced. This is particularly effective for subscription services who charge monthly fees. Instead of charging at the end of the month, services such as Netflix, NBA league-pass and Spotify all charge before the monthly period begins and have recurring charges on the same day each month. By using these three pricing strategies, sellers are better able to justify their price and improve the perceived value of their product or service. Be sure to look out for these tips in the future and don’t forget to take a peek at some of our other SAMMPress articles!